This recipe is a healthy alternative to KFC. After trying out different versions of online recipes , I came out with my own formula. 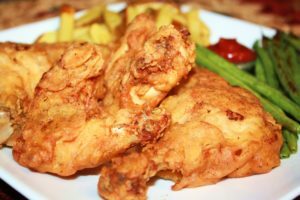 Try it out and let me know the feedback.This is a medium portion recipe for those who crave KFC. 1.Clean and poke the chicken pieces with a fork all over and on both sides. 2.Marinate chicken with lemon juice and salt for 2 hrs. 3.Beat egg and milk together and keep aside. 4 Mix rest of the ingredients in a food processor along with salt. 5.Now dip the chicken pieces in the dry flour mixture, then in egg mixture & again in flour mixture evenly on all sides of the chicken pieces. 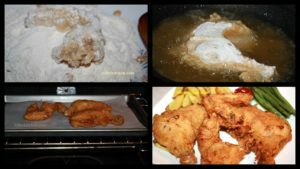 6.Now fry the chicken in a deep bottomed vessel one at a time for about 4 to 5 minutes on each side. 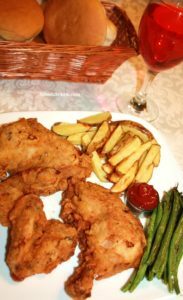 7.Bake the fried chicken pieces in a preheated oven at 350 degrees(10 to15 minutes) to add extra crispiness and get rid of excess oil. 8. Enjoy the chicken pieces with baked vegetables and buns..a healthier version of KFC.